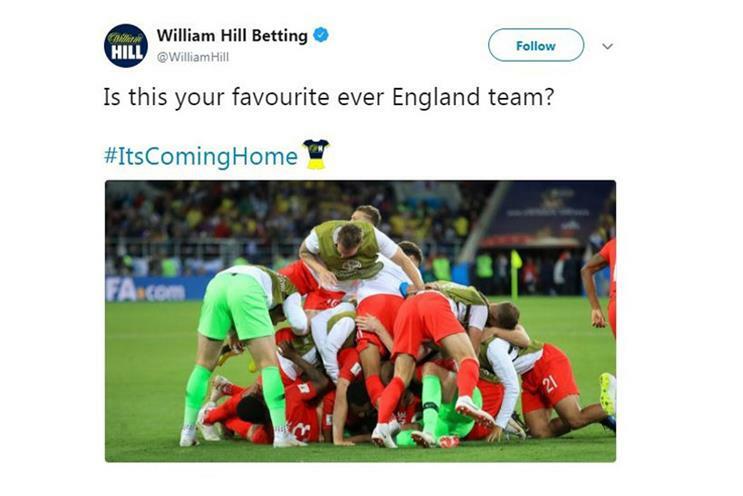 William Hill has been accused of "hijacking" England football fans' popular "It's coming home" refrain, after sponsoring the hashtag on Twitter. "ItsComingHome" - a line which harks back to The Lightning Seeds’ 1996 football anthem Three Lions - has been increasingly used by England fans when celebrating the team’s progress to the quarter finals of the World Cup in Russia. According to data from Twitter, "#ItsComingHome" had been tweeted 1.4 million times in the three weeks leading up to England’s dramatic penalty shoot-out victory over Colombia on Tuesday (3 July), and then half a million times during that game alone. However, fans using the hashtag have also been sharing a football shirt emoji featuring the William Hill logo, as part of the bookmaker’s promoted trends and First View campaign on Twitter set to last the duration of the tournament. While Twitter would not comment, a source at the social network insisted that the emoji has been used in conjunction with "ItsComingHome" since the World Cup began, and that the brand had not co-opted the hashtag after it "caught fire". However, the move has been criticised on social media, with many using misspelled versions of the phrase (for example "ItsCominHome") to avoid the emoji, while others have accusing William Hill and Twitter of surreptitiously allowing football fans to share gambling ads. William Hill had not responded to a request for comment at the time of publishing. Completely agree with this. Was saying yesterday how uneasy it feels that a William Hill emoji pops up when anyone uses #ItsComingHome. Hundreds of thousands of unwitting gambling ads in the last 48 hours alone. England's last 16 tie with Colombia secured ITV the highest TV audience since the London 2012 Olympics. A one-minute peak of 24.4 million viewers at 9.52pm tuned in to see Eric Dier secure the nation’s football team secure first ever World Cup penalty shoot-out victory, representing an 81% share of viewing. It was the highest peak audience for live sport since England faced Portugal in the quarter-final of the European Championships in 2004, when 24.7 million watched the Three Lions tumble out as a result of dreaded penalties.